Mobile security is a much talked about aspect these days, with frequent cybersecurity breaches posing a threat to mobile users. If you are looking for the best mobile security app to keep your phone safe, you need a Le VPN app for your device. The best mobile security app keeps your location and other data confidential. The importance of protecting your mobile devices against online threats is rising over the years. As per the latest study by Verizon, several organizations are not taking mobile security seriously. 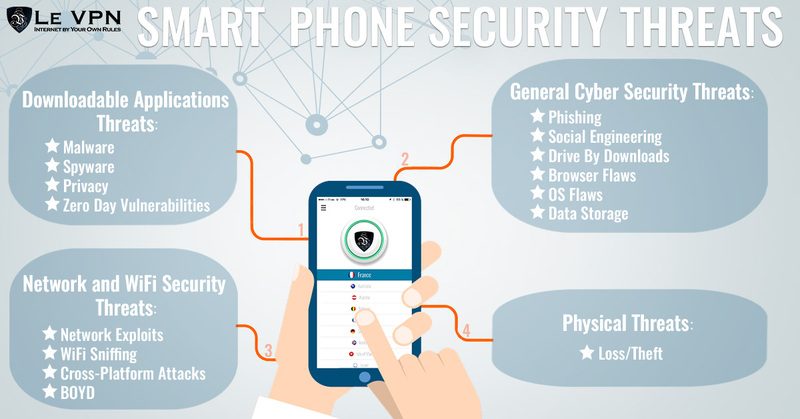 Have a look at these statistics to get a concept about the potential threats that the mobile devices are exposed to. 39% of the companies make changes in the default passwords on their mobile devices. 38% of the companies use two-factor authentication on the mobiles. 49% of the companies have come up with a policy regarding the use of public Wi-Fis. 47% of the companies encrypt the transmission of valuable data across public networks. If you want to know what is a VPN, here is a basic idea for you. A VPN is an encrypted virtual tunnel. It is used to establish a secure connection to the internet. Le VPN protects the Android set, regardless of your location. When you use a VPN for Android, your internet connection remains 100% secure, even when you are using public Wi-Fi. Get the best mobile security app to keep your data secure in your Android set. A VPN stands for Virtual Private Network, which keeps your device’s location and details confidential. When you install Le VPN app on your Android set, you can keep your identity and location private. The users can enjoy secure browsing, free from the threats of online information theft and hacking. Le VPN prevents hackers from tracking you in the cyberspace. Firstly, you need to get the best VPN for Android to ensure 100% protection of your data. These apps also come with a wide range of benefits, like unblocking restricted websites, bypassing internet censorship, and filter the content on your Android device. The reputed VPN app providers, Le VPN, enables the users to connect to any server in several countries. You can get access to online media that is kept for other countries when you use the best mobile security app. You can also stream foreign TV and live events on your phone. Therefore, enjoying a vast pool of entertainment. It is wise to install a VPN app on your mobile, which will keep it safe from the potential online threats. The encrypted VPN connection will protect your device, even when you use public Wi-Fis. Le VPN is a reliable VPN service provider in the market. It ensures complete security to the users. We assure 100% confidentiality and do not keep any traffic logs. We provide access to the users to media content in more than 114 countries and ensure top-level encryption. Download the best mobile security app on your Android set. Above all, the subscription is not costly. Pay only $69.60 for Le VPN’s 2-year plan, i.e., $2.90/month.